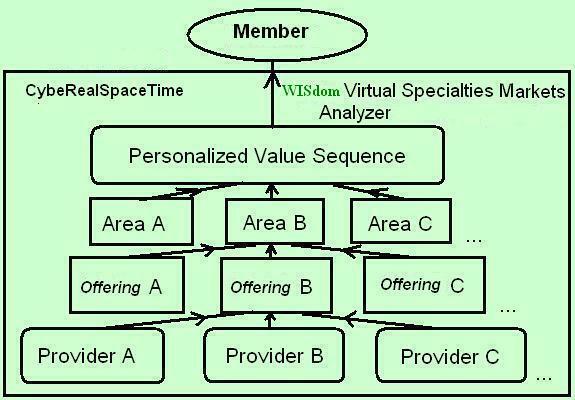 "Virtual Specialties Markets in Cyberealspacetime" are proposed to be implemented as ad hoc SQL-accessible Desktop OLAP extracts (OLAP offline cube files) from the WISdom Network Consumer Goods and/or Services and Information Database (C GSI Db, an online object-oriented relational database). VSM objeccts are built by the WISdom Network Virtual Specialties Market database server function from that database or directly by RSS Feed from cooperating providers, in response to the WISdom Co-op member's expressed shopping (research) needs, using information from the C GSI Db for the WISdom Network "GSI Type" ("Virtual Specialty", or roughly analogus to consumer goods and/or services grouping by physical retail outlet Type, as in traditional shopping malls) and WISdom Network-approved Provider address/product/prices in the geographic area(s) in which the member must shop to enable delivery by the member's required date and time. SleepyCat Software's XML database engine and My SQL are good Open Sourc possibilities for the basic code. Intersystems seems to have the most appropriate offering for this usage available now (6-04), but it's not Open Source. Surf the Pipeline to CybeRealSpaceTime! The Virtual Specialties Market offline cube files enable rapid local client timespace 4-dimensional object-oriented access to analyze, evaluate and compare goods and/or services offerings (including information services) by Product brand or Type, ("Specialty" or category) and Provider(s) operating in some or all WISdom Network Service Area(s) that are convenient to the member, from where purchases can be picked up or delivered within the member's desired earliest and latest delivery dates/times, enabling supply chain initiation and optimization for centrally supplied items, or local route optimization mapping, with business process execution controlled via BPEL for shopping pickup and delivery by the WISdom Network Service Area personnel or by the individual member. The WISdom Prospector's Desktop and Network SQL-accessible file and system management is also done by means of these cube files. The WISdom Network client-resident VSM cube files are for use with the Java RIA portion of the WISdom Prospector, and these client-resident files will be updated at least daily to reflect any CGSIDb and/or CPPRDb changes made since the cube file's last date/time of update. This could be implemented within the existing HTTP protocol by client-side date/time comparison, but greatest performance seems to call for a custom WISdom Network HTTP command carrying the date/time of client Web element last update for Web server comparison with server element date/time of last update, to download Web elements if, and only if, they need to be be changed. This feature could be added to the open internet HTTP protocol to reduce network traffic and support RIA better, and the WISdom Co-op would be very influential in WC3 decisions concerning open internet protocols. See WebFocus 5.2's Business Intelligence Reporting. Ultimus and SAS in NC are hard at work on Business Process Management and Mapping. The WISdom Network Virtual Specialties Market Analyzer's SQL report generator, supplemented by other non-WISdom Network sources of readily available information and estimates about total consumer goods and services flows by type in WISdom Network Services Areas, will be useful in developing strategic and tactical Business Intelligence and standard accounting information-oriented displays that are built by WISdom Central Area Services and individuals for use by WISdom Local Area Services and Metro/Regional and Central Purchasing Co-ops Supply Chain Management Extranets. By simple VSM Analyzer browsing or specialized analysis of VSM cube files that may include all consumer goods and services tentative order and movement data and private.WISdom Network projected movement summaries at various levels of GSI Type(s) and movements of specific products in cyberealspacetime by selected zip code areas, decisions about franchising and purchasing, disintermediation and market share targets are powerfully facilitated. He who controls the information controls the market. With its waelth of anonymous information about individual localized consumer interests and habits, WISdom Network is positioned to take advantage of recent advances in datamining technology analysis techniques, without infringing on members' privacy rights. Distributed processing with grid computing gives the WISdom Network supercomputing capabilities that can be useful in on-demand datamining analysis of selected information from member's MINEs. On-demand MINEs Analysis enables WISdom Co-op management to keep its finger on the pulse of cooperating member opinions and values. WISdom Network Local and Central Services becomes privy to and organizes a wealth of competitive market intelligence that helps enable the WISdom Co-op's strategy of progressive disintermediation of almost everybody except most producers and some value added providers. What is going on is the building of a neural system for the economy, most noticably here on *the consumer demand side. The supply side's neural system needs some adjustment too, but, at least for now that remains on the back burner for the WISdom Co-op. . . The reader is urged to "walk through" both diagrams using consumer needs for several Types of goods and/or services, e.g., cars, men's shirts, homes, mustard, news, etc. or up-to-the-minute all-inclusive encyclopedic information, when the consumer wants to shop (and perhaps have items delivered) in various areas, e.g., his zip code area only, his zip code area and all adjoining zip code areas, and any/all zip code area(s) in any/all countries. The same should be done for several specific goods and/or services, e.g., French's mustard, Dallas Morning News, and current information about the pros and cons of the string theory of physics, illustrating the universality and superiority of Virtual Specialties Markets. including Matching and Non-Matching goods and/or services Types and brands"
"Specialties" = multiple "GSI Types" of goods, services and information in one VSM. By using these Virtual Specialties Markets the WISdom Co-op member can say (probably by some combination of voice recognition and "traditional GUI") to The Prospector's VSM Analyzer, "Show me all Providers' offerings (Provider A,B, C ...), that Match my need for goods, services, or information types or brand[s] (MatchA, B, C ...), in specified WISdom Network geographic areas (Area(s)A, B, C ...) that can deliver by my desired date/time, and show me these offerings in Sequence by my My Personal Value Rating, as calculated by using an Independent or WISdom Network Purchasing product type specialist rating service and WISdom Co-op members' ratings of received goods and/or services and as individualized by my personal preferences". . .
Actually, with full implementation of the WISdom Prospector's natural language speech recognition all the consumer should really need to say is something like, "I need a new dress shirt delivered by 6 PM today", or "I want to have some renovation or service work done on my house as soon as possible", and let the WISdom Network's intelligent interface provide personalized GSI selection assistance and financial advice. The WISdom Prospector, via the WISdom Network Virtual Specialties Market Analyzer function, would also determine the most appropriate WISdom Network geographic (zip code) area(s) to shop in, so that the order can be picked-up or delivered by the desired time. CybeRealisticSpaceTime prices include all shipping and handling charges for centrally distributed products, and adherence to local policy regarding delivieries from local providers that may be extra charge, but do not include any state and local taxes to enable a fair machine and/or human comparison of members' prices from all producers and providers, regardless of their location in cyberealspacetime.All WISdom Network orders are essentially cyberealspacetime bids that are automatically accepted when the bid price = the offereing price, and lower bids are automaically entered into all WISdom Network member order and delivery aggregations. All order aggregation and consolidation occurs at the local WISdom Network Services level which pockets the earned savings realized thereby. All taxes will be paid by the WISdom Network Local Services that deliver the stuff. Note that a sequence of producer and provider offerings is made available for each GSI-Type that matches the consumer's need. Several HTML entries representing different offerings can then be displayed simultaneously in their own windows, providing as many side-by-side comparisons of offerings as desired by the consumer, or multiple items of the same type may be displayed for selection and comparison and/or re-selection ("ReSearch" in a single matrix (by. eg. GSI-type "features"). VSMs are a valuable localized way to access information about all WISdom Network content offerings. During the Prospector's Search function, GSI-Type keyword(s) (including Boolean expressions with multiple keywords) are identified or derived from the user's verbal or typed input. WISdom Network metacontent for the GSI Type(s) is accessed from the C GSI Db (or from client-resident VSM cube(s)), informing the Prospector's use of WISPER to invoke previously personalized WISdom Co-op member services that may be quite complex, allowing a limited tailoring of these previously customized service to this particular invocation. Any difficulties in the derivation of a single GSI-Type ("Specialty") may be resolved when the metacontent of the "Specialties" is compatible, for example, when aggregated for local shopping trips. Otherwise, the Prospector should say " huh? " The Prospector's ReSearch and Analysis Services functions and tools operate at the GSI-Type level and below at the GSI-Item level, and it's at these levels that VSM cubes show their value for member comparison and evaluation of competing offerings, enabled by their common metacontent when searching for needs (possibly PPV information) from among many alternatives to select the most appropriate offering for the member. WISPER is not expected to be used extensively at this level, but some usage may be required to enable WISdom mobile ReSearch and Analysis functions, and this is facilitated by the Prospector's WISPER support at all times. Network and Desktop Application File Management by The Prospector is Coming! For an example of the full operation via BPEL of the Virtual Specialties Market Analyzer and the WISdom Prospector: the member should be able to select meals and snacks from local restaurants for immediate delivery or for his family's menu for the coming week from the member's WeCook, a WeBookTM cookbook resident in the MINE of his intelligent and personalized interface, by WISPERing to his mobile Prospector about his consumption, plans and needs, and perhaps automatically have appropriate groceries ordered for delivery by the WISdom Network Local Service with automatic disintermediation of local providers. Or, optionally, the software proposed would facilitate appropriate shopping in detail, by presenting the best value provider offerings of a product type first as personalized by his preferences, etc. in several side-by-side comparison windows. The groceries would then either be delivered at the member's chosen date/time by his local franchise or cooperative service, perhaps even during his absence, or could be picked up by the member using an itemized, optimized for total cost savings shopping pickup and delivery route map and instructions generated by the WISdom Prospector. Replenisment shopping, providing as it does a sample that includes several GSI Types ("Specialties") of the WISdom Network's capabilities for detailed research and analysis, combined with the BPEL construction of member-directed automatic functions providing increasingly generalized member services, is seen as both the logical starting point to provide essential consumer services and information, and the means to establish market dominance for the WISdom Co-op. Further expansion of the WISdom Network's content GSI Types that are availaible to these facilities will be demanded. VSMs will enable the WISdom Network to promote the expansion of local "cottage industry". "Mike's Homemade Bran Muffins" and "Ma's Home Cookin' " made by your next door neighbor or community-supported agriculture efforts can directly compete successfully with the local Wal-Mart's bakery goods or produce, backed by distribution via the Local WISdom Service Area's franchisee or consumers cooperative, since both will be dependent only on the goods, services, and information ratings of local WISdom Network members. Note that when the consumer says that he wants goods and/or services Type or brand from all or many areas, and his desired earliest and latest delivery times indicate thatmail order goods will be satisfactory, the number of matching offerings in Virtual Specialties Markets could be very large. The number of matching offerings would be limited, in part by incorporating only the offerings from remote areas that represent "more likely choices" (a member's WISdom Prospector judgement call) for the consumer.